an ectopic heart rhythm with a rate of 170 to 250 beats/min. It begins abruptly with a premature atrial or ventricular beat and is supported by an atrioventricular (AV) nodal reentry mechanism or by an AV reentry mechanism involving an accessory pathway. 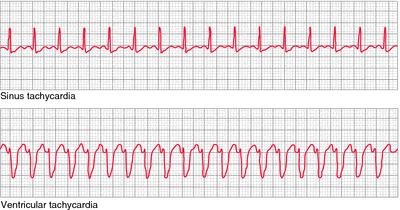 Formerly called paroxysmal atrial tachycardia, paroxysmal junctional tachycardia. A sporadically occurring arrhythmia with an atrial rate that is usually 160 to 200 beats per minute. It originates above the bundle of His, and typically appears on the surface electrocardiogram as a rapid, narrow-complex tachycardia. This relatively common arrhythmia may revert to sinus rhythm with rest, sedation, vagal maneuvers, or drug therapy. 12] If paroxysmal supraventricular tachycardia occurs and the patient is hemodynamically stable then vagal maneuvers, lignocaine, adenosine can be tried. and European countries because of its beneficially effects on heart rate control in artial fibrillation/flutter and stopping/preventing paroxysmal supraventricular tachycardia. Mechanisms of paroxysmal supraventricular tachycardia. Radiofrequency catheter ablation for paroxysmal supraventricular tachycardia in children and adolescents without structural heart disease. 15); no mention of adenosine or esmolol (Brevibloc) in the treatment of paroxysmal supraventricular tachycardia (p 47); no mention of magnesium infusion as treatment of torsade de pointes (p 51) nor a list (getting longer every day) of the drugs that cause it; no mention of cigarette smoking as an "allergen" in asthma (p 100); and no statement was made regarding the lack of efficacy of mineralocorticoid replacement in adrenal insufficiency, but it does appear in the section on secondary adrenal insufficiency, and causes confusion nonetheless (p 497). The generic prescription drug, supplied in 5 and 10 mL vials, is used to treat irregular heartbeats (arrhythmias), including atrial fibrillation and paroxysmal supraventricular tachycardia.